Lovely, pity you can not take it inside. Thanks Paul and Bjs ..
.. yes, indoors, it would soon melt ! Lovely! Did you see that amazing photo of the lighthouse in USA on the news last night? That was really incredible...we think we have it cold here, but we have nothing compared to those guys! Even Paris was colder than here a couple of days ago! Hywel, I took the dog out today for a short walk and I had on my Cossack hat and fur coat etc.etc. and it was so cold I got a headache! Roll on Spring! Yes, Karen... I saw the frozen lighthouse... chilly ! OH yes! 5 days to go! We should have a GOY shortest day ritual celebration!! Any ideas? Perhaps we could have our own solstice ritual and take pics! I'm not doing naked btw....too scary! i love details ~ really nice when people notice them ~ thats why i love to have my camera with me! and thats another reason for taking loads of photos ~ you never know!! Sadly, I think that we will be seeing more similarly themed photos soon (I'm with Karen and Hywel - I hate the winter). lovely photo, I like variegated too -- cheery even on the darkest days ( and we've had a few of those lately! Very decorative TT, makes a very natural Xmas decoration. ... thank you ...yes Mother Nature does it best ! Thanks. 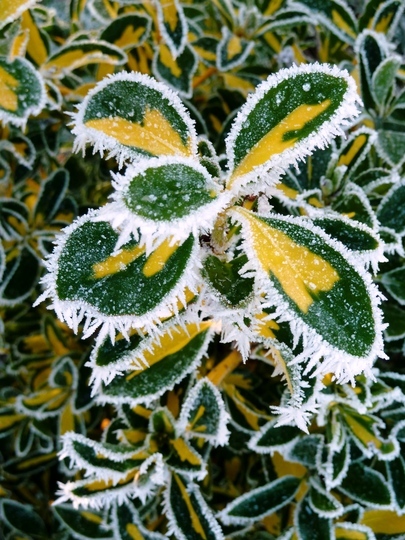 During this cold winter, the structure of the frost is truly amazing !!! I've just checked out Karen's link to the lighthouse....Awesome!! I guess Jamie's lovely home-made bird-table has been much in use this winter ! :o))) Well done Jamie ! just seen that lighthouse today karen ~ couldnt believe it! it was like a sandcastel ~ the photo i saw showed it in grey and very grainy, also reminded me of the pirate ship that comes up from under the sea where they are all ghosts! sorry didnt see that film. may go to see narnia tonight ~ if we the snow doesnt come and make it narnia here first!! Look out for Dufflepuds !!! ive forgotten the characters ~ is dufflepuds a baddie or a goodie?? good idea ~ i'll check that out first thanks! Stunning effect Terratoonie well captured. It looks lovely, mother nature is amazing what she can do. Mother Nature guarantees to melt it all ... eventually ! No snow fell here last night though our daughter who lives in a small village just 5 miles away said they had had snow there! But it's not the first time that we have escaped things like heavy rain, thunderstorms or heavy rain when she has had it there! In fact we were in her house in the middle of August for lunch & there was a big thunderstorm & more rain than we have seen the 9 years we have lived here! Yet a few hours later when we got back home it didn't look as if it had rained here! Several very cold weeks here in the UK ! At first glance I though about the Brazilian flag!!! Micro climate, TT? Perhaps you are right as we seem to avoid most of the extremes other people seem to have. Sometimes it seems to me that we live on another planet when I read people's comments & see pictures of what's happening where they are! We DO (believe it or not) sometimes get heavy rain or snow but even on those occasions we seem to be better off than most others! I don't know what geographical accident accounts for our "benign" micro climate here in H'don but it certainly doesn't stop the winds, which can be as equally devastating here as elsewhere in the country. Just 5 miles away where our daughter lives the weather is often worse than it is here. ... maybe those strong winds blow the worst of the weather further afield... lol. lovely picture and lovely shot simply superb.